The candidates mostly agree about the kind of governor Maine needs, but each hopes to emerge as the one who will get things done. The seven Democratic contenders for governor agree on many of the broad issues facing the state, such as the need to expand Medicaid and put more money into K-12 education. But the candidates differ on the details of how to accomplish those goals and who among them has the best work experience, life skills and political know-how to get the job done in an increasingly divided state. 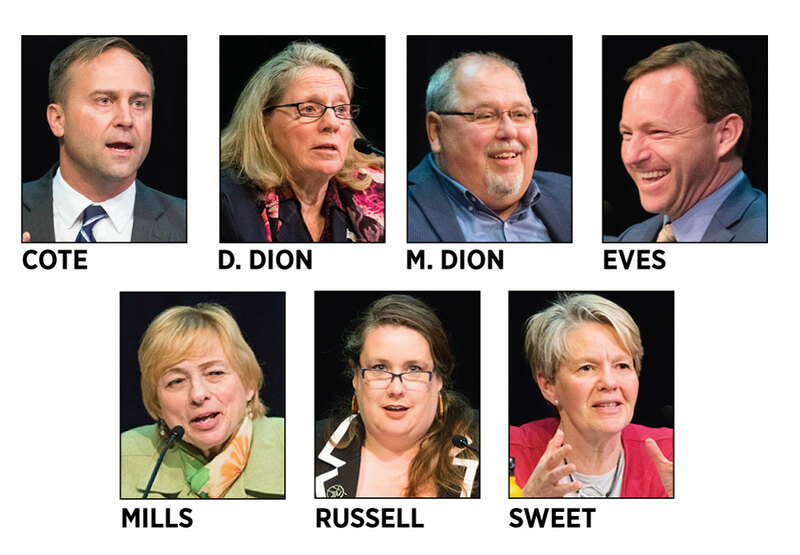 The seven candidates – Attorney General Janet Mills of Farmington, former House Speaker Mark Eves of North Berwick, attorney and veteran Adam Cote of Sanford, advocate and lobbyist Betsy Sweet of Hallowell, senator and former sheriff Mark Dion of Portland, former lawmaker and progressive activist Diane Russell of Portland, and former Biddeford Mayor Donna Dion – are outlining progressive platforms likely to appeal to the party loyalists who will turn out for the June 12 primary. And while the four Republican gubernatorial candidates are vowing to continue Gov. Paul LePage’s legacy, the Democratic Blaine House hopefuls insist Maine needs a more inclusive, collaborative and open-minded leader to face its social, demographic and economic challenges. Despite the fact that 59 percent of Maine voters approved a ballot measure expanding Medicaid last November, the 70,000-plus would-be beneficiaries appear no closer to receiving health coverage. The LePage administration has yet to take steps to implement expansion, and the 2018 legislative session collapsed in the final days amid partisan bickering over the issue. All seven Democrats strongly support expanding Medicaid immediately to take advantage of the 90 percent funding offered by the federal government. They all agree that reserve funds in the state’s Medicaid account will cover much of the first-year costs, estimated at $45 million to $55 million. But some have different ideas for funding, as well. “Medicaid expansion would be funded in my first budget, and the way we fund it is by making corporations and the wealthy pay their fair share,” said Eves. He said his plan includes closing corporate tax loopholes, expanding the sales tax to apply to more goods and services, and “rebalancing our income inequality” by rolling back some of the recent income tax cuts that benefited wealthier Mainers. Eves and Mark Dion also talk about the need for a Medicaid or MaineCare “buy in” that would allow other Mainers to purchase insurance through the program, with rates depending on income levels. But before the expansion happens, Dion said the state needs a special health care cost commission – similar to the Public Utilities Commission – to examine fee structures charged by hospitals and other providers as a way to move toward uniformity of costs. Mills, meanwhile, has proposed using $35 million in newly negotiated legal settlement funds with tobacco companies to help pay for the first year of the expansion. Furthermore, Mills said the current budget surplus – estimated at $140 million – as well as unspent funds in the state’s Medicaid account could be used to help cover any additional costs. Russell agreed with Mills’ proposal to tap into the $35 million in additional legal settlement fees plus the available Medicaid funds. “We just need to get it going because once you start seeing the money come in from the federal government, … that is where we are going to see savings over time,” Russell said. Sweet, who has lobbied on behalf of low-income Mainers at the State House for 35 years, said the state should tap into the existing reserves in the Medicaid program, eliminate corporate tax loopholes, reinvest in the state’s public health infrastructure, emphasize healthy lifestyles and conduct a full audit on the Department of Health and Human Services’ Medicaid account. She also accused the LePage administration of turning down millions in federal dollars that could have been used for preventative care, which ultimately lowers health care costs. Cote predicted that the estimated influx of $500 million in federal funds into Maine’s health care system will help boost the economy, which will in turn boost the revenue available for future state budgets. Donna Dion also believes that, over the long run, Medicaid expansion will pay for itself in part by spurring growth in the health care sector. But Dion said she would also look into other ways to help pay for expansion. For instance, while working for a Portland-area nonprofit that supports individuals with developmental and behavioral challenges, Dion said she noticed that the organization had to pay a 6 percent “user tax” back to the state for some federally funded Medicaid services. That equated to $45,000 to $50,000 a month for their nonprofit, but Dion said she was unsure how the state utilized that money. “I would like to have a total audit of those funds and see what is coming in on a monthly basis and whether that could help us pay for the cost of Medicaid expansion,” she said. Maine voters approved a ballot initiative in November 2016 to charge wealthier residents a 3 percent tax surcharge to fulfill the elusive 55 percent state-funding benchmark for schools approved years ago by voters. Months later, lawmakers repealed the tax surcharge and allocated $160 million in additional funding – roughly half the $300 million envisioned – to schools. But the allocation only covered one year, and lawmakers left school funding levels in limbo last month by adjourning the 2018 session without finalizing the budget language. At least three of the Democratic contenders – Sweet, Russell and Eves – said their primary way of funding schools would be to reinstate the 3 percent tax surcharge on wealthy Mainers. Sweet said that without a “first-class, quality education,” the state will never achieve its goals of keeping young Mainers in the state and attracting other young families. Eves, meanwhile, said his first budget proposal released within weeks of taking office would fund schools at 55 percent through a combination of ending corporate tax loopholes and increasing taxes on the wealthy. Dion has said repeatedly during forums and interviews he will not make pie-in-the-sky promises – whether about education funding or “universal health care” – without making clear that they come with costs, oftentimes to taxpayers. “Talking to people about taxes, I think people are willing to pay taxes for something that is truly a benefit,” he said. Others said they would seek revenues elsewhere. Cote, a former member of the Sanford School Board, said LePage’s focus on tax cuts has merely placed more of the burden on municipalities facing shrinking state allocations through revenue sharing. At the same time, schools across the state have been forced to work to comply with the proficiency-based learning standards mandated by the state. But while he supported the 3 percent surcharge in November 2016, Cote said Maine needs to leverage federal dollars left on the table by the LePage administration as well as grow the economy to generate more tax revenue. Donna Dion – no relation to Mark Dion – said the state needs to “bite the bullet” and get to the 55 percent funding level but didn’t have any concrete proposals for how to get there. She said the state should look at eliminating tax incentives that are not offering a good return on investment, “tighten up” revenue streams and improve communication within state departments – particularly within the Maine Department of Health and Human Services – to reduce duplication. Dion said she didn’t support the November 2016 ballot initiative because she didn’t like the process. Mills said the state needs to look at its funding formula to figure out why some districts are doing better than others, with some actually exceeding the 55 percent state-funding goal and others not. But the state needs to take a larger role in ensuring that computer sciences – including programming and coding – are offered in every high school. “These are the critical needs and talents that we need to develop, and the skills,” she said. Mills said her office used funds from a legal settlement with Bathfitters to create plumbing technical training programs in four high schools. In the past two years, those programs have graduated more than 100 students. By all accounts, Maine is facing a workforce crisis. Already the oldest state in the nation on a per-capita basis, 50 percent of the state’s population will be at retirement age within the next several decades. That trend will merely increase the challenges of finding high-skilled workers – including nurses, shipbuilders and engineers – needed to keep the economy humming. All seven candidates talked about the need to expand vocational and technical training at the high school and postsecondary level, echoing concerns raised by LePage and Republicans about an overemphasis on all students attending college. But in a clear difference with the anti-immigration rhetoric often heard from Republicans, every Democratic candidate emphasized the importance of welcoming highly skilled immigrants to Maine. Mills, Mark Dion and Russell specifically called for taking steps to expedite the licensing and certification process for immigrants who were highly trained professionals in their home countries. Dion said the state needs a more robust apprenticeship program, but it will also have to address issues such as affordable housing, health care and student debt to keep young workers in Maine or draw others here. Mills said the state needs to ensure businesses’ workforce needs are paired with the training curricula of high schools, universities and community colleges. But the governor and administration officials should lay out a vision and push those priorities through the Legislature as well as the appropriate boards, she said. Mills said she would like to see another tuition freeze and credited the University of Maine System with adopting policies that encourage more out-of-state students. Sweet said Maine needs broadband throughout the state and could do more to help start-up businesses, especially in the field of agriculture, where young people are driving a growth in the industry without much government help. Likewise, Russell said one of the key components of addressing Maine’s skills gap and workforce issues is addressing the state’s student loan debt problem. She said Maine needs to make two-year colleges more affordable while lifting barriers that prevent working-class parents from improving their education, such as high housing costs and a lack of child care options. Donna Dion said there are many opportunities to tap into federal programs – and dollars – to help with workforce development. She said she worked with York County Community College to establish a metal trades program that has yielded several hundred graduates and was later expanded to other locations. Eves said he would seek to boost centralized vocational training programs to help young Mainers find steady, good-paying jobs after high school. He said the governor also needs to promote industries he believes Maine can lead: renewable energy, aquaculture, agriculture, and niche industries such as craft beer. But he also said Maine needs to be a more welcoming state to all types of immigrants.